A 2-2 draw in toady's AC Leage match with harwell, was enough to elivate Phyllis Court to joint top of the SCF Association Handicap Leagaue. Michael Wiles and Harry Midgley took us into an unassailable 2-0 lead in the afternoon matches but Chris Roberts and Frances Colamn fell fould of their visitors generious handicaps in the evening. The latte Harwell pair played very well, and indeed both played much better once they had exausted their bisques. We scored an emphatic 6-1 win in our first South-East Federation League match at Canterbury today. The 220 mile round trip to deepest kent was no hurldle for our quartet Chris Roberts, Frances Colman, Helena & Mike Fensome, who now look on to future tough matches against Surbiton, Dulwich & Woking. Fourth seed Pam Mead crashed out of the Open Singles Competition to Ian Norris (near right) on the back of her doubles defeat with Helena Fensome, at the hands of Mary Gaynor & Don Rutherford. And in the second tier, 5+ Singles, holder Raymond Wood lost to AC spcialist Brian Bucknall (far right). 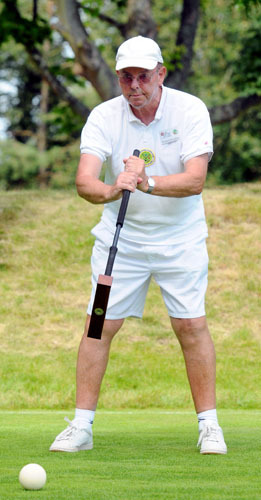 So see the progress of all our cometitions, click on the 'Golf Croquet' button (left) and select your comptition. A shakey 7-5 games win over Harwell today was just enough to secure a second victory in this short SCF League campaign. 1st pair Chris Roberts & Frances Colman dropped a doubles runner and then missed out 6-7 in all four of their singles matches. However 2nd pair Helena Fensome & Pam Mead bounced back from their surprise Open Competition loss, won all their games & carried the day. Winchester won the SCF Level League title, by dint of greater number of game wins, after they and Ryde drew with us on two wins a piece. - Michael Wiles makes Chris sweat! Chris Roberts had to pull out all the stops to defeat an 'on fire' Michael Wiles (right) in their Open Singles quarter-final this evening. that turned on the 10th hoop that was contested for about 20 mins, leading to another 7-5 result. We were pleased to welcome Thames Yalley CC for a return friendly fixture yesterday, and by all accounts and despite another narrow loss, everyone enjoyed their day. 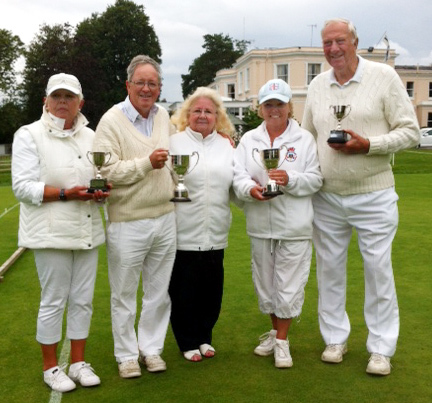 Our top performers were Sheila Stoker & John Kennedy who won three of their four matches. as the reaminder of our PCC'friendly' team: Pat Eades, Ray Boardhead, Dianne Browne, Rosemary Noel-Clarke, Ann Norman & Rae Kennedy all equipped themselves well. A catch up with the Handicap maths revealed that rapid riser Ian Norris (right) became a five handicap a couple of matches ago and is now knocking on the door or becoming a 4 handicap. 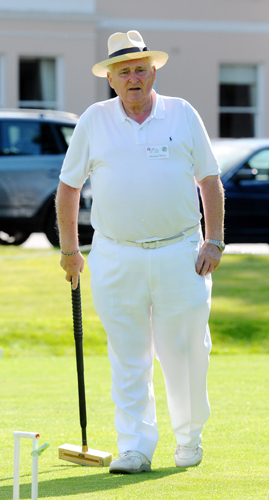 Not only that but Ian is the first player to reach a competition final this year ( 5+), he is in the semis in the 'Open' and '7+' competitions. Add to this his high profile scalps, Pam Mead and Mike Fensome and it really makes Ian 'The One To Watch'. 10th August - PCC 'A' reach National Semi-Finals! Phyllis Court progressed to the semi-finals of the National GC Inter-Club Championship with an impressive 6 - 1 win over Broadwas today. 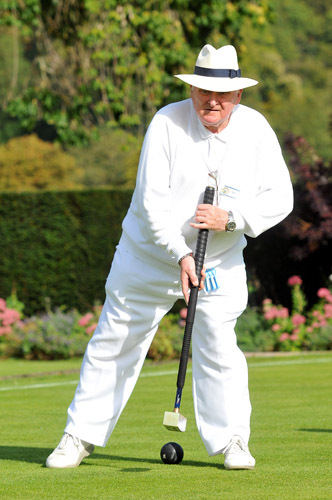 The rain forced decision to postpone the original fixture three weeks ago provided an unexpected dividend, as the sun beat down on the lush lawns of the Henley-on-Thames Club. It is a mark of the seriousness with which this competition is taken that future opponents come to do their 'homework' on up-coming opponents. Who is that who has come to watch the action? "The name is Barnacle,..... Roger Barnacle". On Winchester's not-so Secret Service, 007 has a 'License to Spy' ahead of his team's semi-final against the winners of today's tie, and it was lovely to have his support and interest. But there is no such thing as 'free lunch' and the chance to have the World Championship Final referee to perform that role for us was not to be missed and he was soon pressed into service. 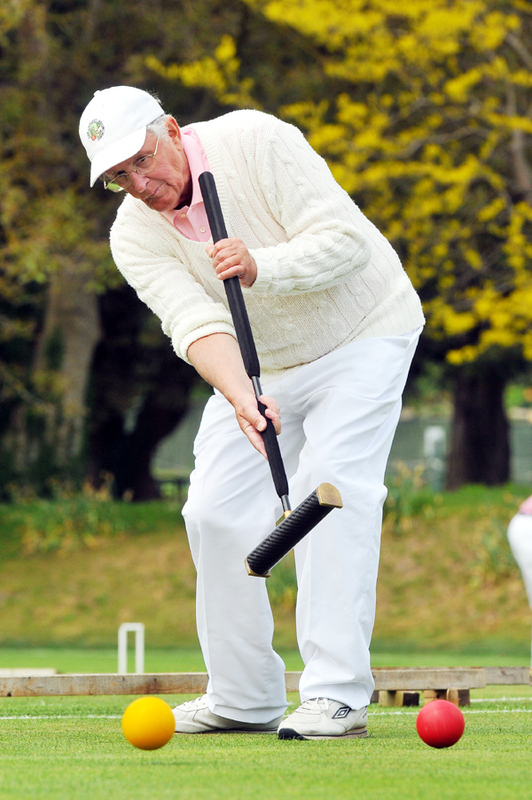 As to the croquet, it was a 'cat and mouse' sort of day from the out-set with well contested hoops leading to very long games indeed. Pam Mead got Phyllis Court off to an excellent start with victory over Trevor Swindells and the hosts then extended their lead when Chris Roberts and Helena Fensome took the doubles in two straight games after a real fight. Frances Colman came back from a first game reverse to win the second and as lunchtime beckoned, the decider was 'put on ice', only to be played if necessary. Duly refreshed, and with Phyllis Court leading 2-0, it was still all to play-for as the afternoon singles got underway. Roberts was first to finish his singles, which surprised him after two more very long games to defeat the accurate Stuart Smith. And soon after Fensome matched his double 7 - 4 scoreline, to seal the match for Phyllis Court with victory over John Guy. The icing on the cake was Colman's hard fought three game victory over Swindells. Mead and Broadwas' Evans took one win each in their tie and as the sun sapped energies, the decider was again left un-played with the match result known. So Phyllis Court won by 5 wins and 'two halves' to Broadwas' 'two halves' - or more simply 6 - 1. And so it will be an all Southern Federation semi-final when Phyllis Court travel to Winchester in just under a fortnight's time on Thursday 23rd August. Frances Colman kept hold of the lovely One Ball Trophy today at the end of a good tournament run under handicap rules, as introduced last season. 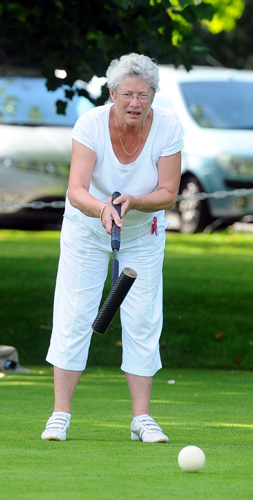 She beat Ian Norris in the final and he was the surprise package of the day, having never played Association Croquet before. Ian took to the game like a duck to water and soon caught the eye of our AC organiser Brian Bucknall as having great potential for the future. But back at today's tournament, the 11 players were split into two blocks and soon after lunch Frances and Ian emerged the two first stage winners, with Chris Roberts and Don Rutherford also qualifying for the semi finals. Ian dispatched Don in fairly quick time and Frances showed too much 'savvy' with her last bisque for Chris. The final saw soon Frances overhaul Ian's confident start but he wasn't laying down that easily and hit two super 20 yard roquets to stay in the game with Frances poised to take Rover and go to peg. 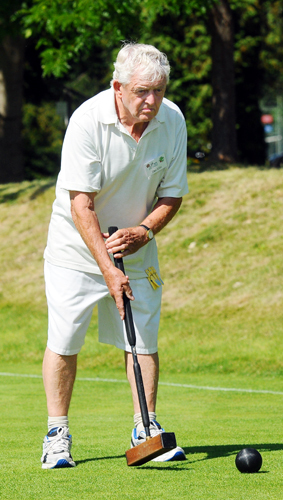 Our first Croquet Association GC 'B' Level Tournament 'Smokey's Cup' proved a huge success and ended with victory for Raymond Wood. Holding off a challenge from 15 other players from 9 different clubs, Raymond ended the two day event with just 3 defeats once every player had faced each other. 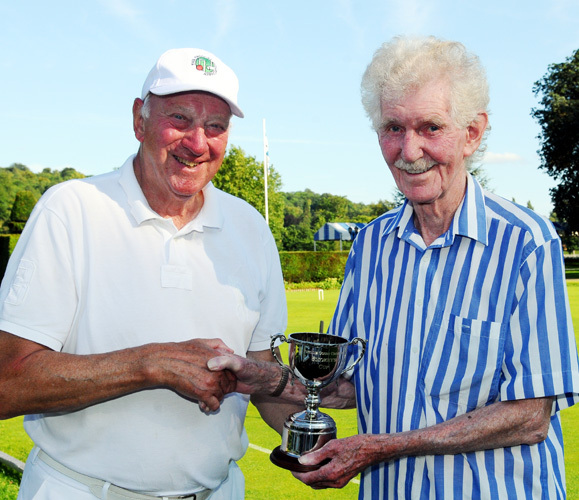 This gave Raymond a clear 'two wins' margin of victory over his nearest rivals Richard Keighley (Wingrave) & Dan Ellis (Eyensham) and he was all smiles when recieveing 'Smokey's Cup' from the man himself, our President Smokey Eades. Michael Wiles inished 4th with 9 wins from his 15 games, Mike Fensome (6th, 9 wins), Don Rutherford (9th, 8 wins), John Kennedy (13th, 6 wins), Dilys Earnshaw (14th, 6 wins) and Hugh Crook (15th, 4wins). The high quality of opposition that we had been seeking by entering the South-East Federation League was found today at Woking where our team: Chris Roberts, Helena Fensome, Frances Colman & Mike Fensome faced opponents all one handicap grade better than themselves. Chris was pleased to beat scratch player Malcome Bigg for the first time and elsewhere all played better than the 6-1 match scoreline suggests. Over 70 members joined together for our Summer Party this evening in the Grandstand, and a lovely time was had by all. On the Courts, Raymond Wood leads Andra Huxly of Gulidford in our Flagship Tournamnet of the season. 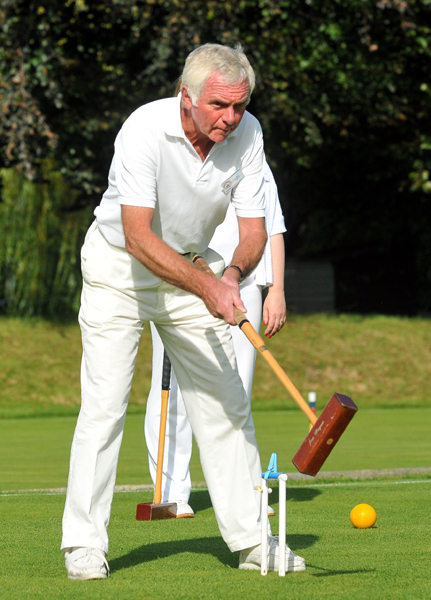 PCC 'Association' consolodated Leage top position with a 4-0 win over Blewbury this afternoon ad evening. Our team Chris Roberts, Harry Midgley, Brian Bucknall and Frances Colman all enjoyed the short grass of the fast and true Blewbury courts. Fensome halved their doubles rubber and Mike Fensome took both his singles opponents to three games. Harry Midgley & Michael Wiles (below, far right) beat Brian Bucknall & Raghu Iyer in the final of the season long AC Doubles comptition. The pair built a good lead early on and their opponents failed pag them back.So the Greenbury Bowls will have new names on them this season. Clockwise from top left: Richard Keighley (Wingrave, runner-up), Dan Ellis (Eynsham, 3rd) Michael Wiles (Phyllis Court, 4th), Andrea Huxley (Gulidford, the early leader) and Raymond Wood recieving congratulations as winner from Smokey Eades. 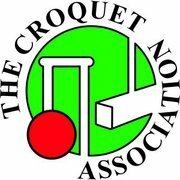 PCC 'A' fell at the semi-final stage of the National Inter-Club Championship for the second year running today. Last season it was Surbiton who proved too good for us, today it was Winchester's big guns who blew us away. On paper Winchester where stronger that our side and it proved that way on grass too! Two drawn rubbers was all we had to show for the day despite some spirited play that saw unusual match-ups due to a quirk of the competition rules. Players were ordered by virtu their National Rankings position which currently has Mike Fensome and two of the Winchester players stationed unexpectedly high due to them not having played many counting games. Chris Roberts duly parnered Mike as the top pair and they drew their doubles tie against Winchester's scratch AC pairing, who's golf expertise improved as the fixture wore on. Elsewhere the singles ties all went the way of the hosts, save Roberts' who achieved another draw, but he did throw away a likely victory with a poor 13th hoop. So it is 'tails between the legs' for our team of Roberts, Fensome, Helena Fensome & Frances Colman, who played well, but just not as well as Winchester. A new tournament but by now a familier winner - Ian Norris took the inaugral 5+ GC Tournament today defeating John Chalfornt in a strangley one sided final as Michael Wiles took third just ahead of Mary Gaynor. The surprise package of the day was Margaret Broughton who won two of her group games to earn a place in the top knock-out event. In the event she won the middle of her games after lunch but lost the other two, but she should be rightly proud of her improvement. There really is no holding Ian Norris this sesason and he has won again! This time retaining the Suzanne Roberts Quaich as the winner of the season long 7+ competition. Relative newcomer Ian, defeated the expierienced Pat Eades a the final yesterday that saw Pat win the first game before Ian prevailed. 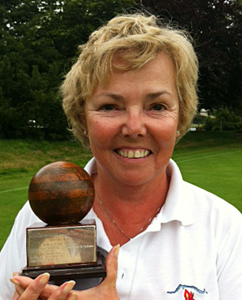 Phyllis Court secured both the SCF Assocaition and Golf Handicap Northern League titles in the space of the last two days - a really good achievement! On Saturday, our Association team drew with Eynsham to wrap up their league, and yesterday PCC 'B' completed a fourth sucsessive league win, with victory over High wycombe, to wrap up thier league even with a game still left to play! Both teams are undefeated this season and can look forward very positivly to play-off finals against the winners of the Southern Area Leagues. - Really well done to both teams! Charlie von Schmieder and Bob de Board sprang a big surprise this evening to knock holders Chris Roberts & Frances Colman out of our top doubles competition. And it wasn't all Charlie doing by any means as Bob, fresh from celebrating the start of his 80th year, hardly put a foot wrong and indeed pulled the match winning shot out of the bag when his side's fortunes looked bleak. Charlie marshaled Bob expertly of course and was on top form himself and the pair escaped to an easy 7-1 first game, only to be pegged back to a 2-7 reverse in the second. The third went to the 13th hoop thanks to Bob's wonder shot at the 11th and a couple of missed clearances later saw the 'Master and Apprentice' duo into the final. Frances Colamn & Chris Roberts made up for their surprise elimination from the Open Doubles Season Long Competition yesterday, by winning the 'Iain Lindsay' Open Doubes Tournament today. Although beaten into second place in the block round by that wiley pair Mike Fensome & John Stanner, they played better in the afternoon to win through to a closely fought final at the expence of the other block winners Mary Gaynor & Michael Wiles. Beaten finalists were second seeds Helena Fensome & Raymond Wood, who themselves came through in second place in their block by the margin of just one hoop following a three way tie involving the unlucky AC specialist pair Brain Bucknall & Harry Midgley. It was great to welcome Harry into his first golf tournament and also to newcommer Barrie Scott who also impressed in his first tournament of any kind. In the Final, Colman & Roberts took the lead at the 3rd, and despite some very long clearences from Helena, and a 6th hoop being contested for about 20 minutes, they were nerver behind agian. The game turned at 8th when a crucial block by Frances forced an unsucessfull hoop shot from Helena and the 7-3 final result felt a lot closer than that scoreline suggests. Last seasons winner Sylvia Thomson presented the cups with the playfull warning that they were only on loan and she would be back from injury to win them back next year. Helen Walker made an unexpected GC team debut for PCC 'B' who beat Wingrave to end their SCF Handicap League North programe with 100% success. An injury forced the withdrawl of Mary Gaynor from the regular team line-up and with several other players sounded out as replacements, Frances Colman was in line to make up the numbers this afternoon. But on arival at the Club, Helen was seen to be finishing an AC game and said she would be happy to despite being a GC novice. So Frances rested her shoulder and Helen not only played but won both her singles games and one of the doubles too (even scoring with her first try at a jump shot!). The rest of the team, Raymond Wood, Mike Fensome & Chris Roberts did well too and colectively the team lost just two doubles and won everything else for a convinsing 10-2 win. PCC 'B' now await the identity of the winners of the South League wh they will face in a play-off final at hamptworth on Friday September 28th.